ChildproofingExperts.com is a web site designed by Visible Logic for the International Association for Child Safety (IAFCS) as a resource for information on childproofing, and helps to connect care-givers with professional childproofers. Their e-newsletter needed to match the branding established on their web site, as well as offer up-to-date and unique tips for parents. Like many trade associations, the IAFCS was seeking ways to increase awareness of their member’s businesses. Their content marketing strategy was focused on external communication to potential end consumers. Gathering email addresses from their resource-rich web site was a great way to allow them to speak directly to these prospects. 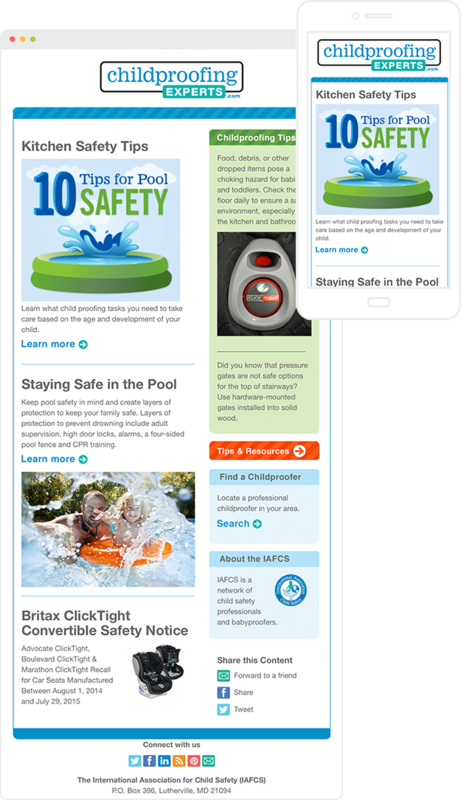 ChildproofingExperts.com sees their e-newsletter as part of a larger content marketing strategy. Easy social sharing buttons pushes content from their e-newsletter onto Facebook and Twitter. On their web site, ChildproofingExperts.com offers an educational resource to people who subscribe by email.